Breast-conserving therapy, consisting of breast-conserving surgery (BCS) followed by adjuvant radiation therapy, represents a mainstay in the treatment of early stage breast cancer.1-3 Traditionally, radiation therapy following BCS has consisted of standard whole-breast irradiation (SWBI) followed by a tumor bed boost with a 5-7 week duration of treatment. However, the length of treatment is one factor associated with noncompliance with adjuvant radiation therapy following BCS.4,5 To reduce treatment duration, decrease healthcare resource utilization, and potentially limit toxicity, alternatives to SWBI have been developed including accelerated whole-breast irradiation (AWBI) and accelerated partial-breast irradiation (APBI). AWBI represents a standard of care treatment option based on 4 randomized trials that have demonstrated comparable clinical outcomes and toxicity as compared to SWBI with long-term follow-up.6-9 APBI can be delivered with anmultiple techniques including interstitial brachytherapy, applicator brachytherapy, and external-beam techniques. With the publication of 7 randomized trials, a large amount of data supports APBI as a standard-of-care treatment option following BCS in appropriately selected patients; however, data demonstrates that APBI remains underutilized despite the potential benefits for patients.10 Therefore, the purpose of this review is to evaluate data supporting APBI and examine questions clinicians face regarding APBI. At this time, 7 randomized trials comparing APBI with SWBI and/or AWBI have been published in abstract or manuscript form with five (National Institute of Oncology-Hungary, GEC-ESTRO, University of Florence, IMPORT LOW, and Hospital de la Esperanza) publishing clinical outcomes while two (RAPID, NSABP B-39) presented only toxicity data (Table 1). With respect to external-beam APBI, several randomized trials have been published. 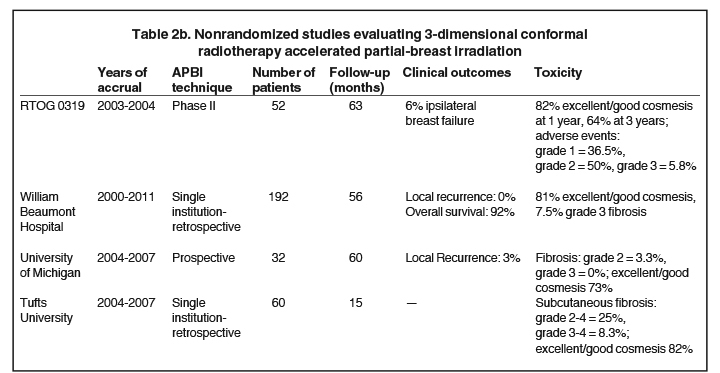 The Randomized Trial of Accelerated Partial Breast Irradiation using Three-Dimensional Conformal External Beam Radiation Therapy (RAPID) trial randomized 2,135 patients (tumor < 3 cm, node negative, nonlobular, margins negative, age > 40) to SWBI/AWBI or APBI delivered with 3-dimensional conformal radiation therapy (3D-CRT) (38.5 Gy/10 fractions, twice daily). Interim analysis demonstrated worse cosmetic outcomes with APBI as well as rates of grade 1/2 toxicity.13 However, these findings are inconsistent with an analysis of the NSABP B39 3D-CRT cohort, which demonstrated 0% Grade 4/5 toxicity and < 3% Grade 3 toxicity, and a smaller randomized study from Barcelona that demonstrated reduced acute toxicity with 3D-CRT APBI.14,15 More recently, a randomized trial of 520 patients (tumor < 2.5 cm, margins > 5 mm, age > 40) from the University of Florence compared SWBI with APBI, delivered with IMRT (30 Gy/5 fractions, every other day). At 5 years, no difference in the rates of local recurrence were noted (1.5% SWBI vs. 1.5% APBI) with improved cosmetic outcomes as well as reduced acute/chronic toxicity with APBI.16 Similarly, the IMPORT LOW trial has been presented as an abstract; the trial compared AWBI (40 Gy/15 fractions) with APBI (40 Gy/15 fractions) and AWBI with a boost to the tumor bed (36 Gy/15 fractions whole breast, 40 Gy/15 fractions partial breast). The trial enrolled 2,018 patients (tumor < 3 cm, N0-1, margins > 2 mm, age > 50) and found no difference in rates of local recurrence at 5 years (1.1% AWBI vs. 0.5% APBI vs. 0.2% simultaneous integrated boost). Additionally, APBI was associated with decreased breast appearance changes as compared to AWBI.17 Taken together, several key conclusions can be drawn: 1) randomized data supports that there is no difference in local control with APBI as compared to SWBI, 2) randomized trials with multiple techniques have demonstrated consistent findings, and 3) toxicity data supports no difference in outcomes between interstitial APBI and SWBI, while data with external-beam APBI favors IMRT or daily radiation compared to the 3D-CRT technique. At this time, there is limited ability to directly compare different APBI techniques, as the trials above used a single APBI technique (with the exception of the National Institute of Oncology trial). However, with the anticipated publication of mature outcomes from NSABP B-39, clinicians should have data to directly compare clinical outcomes and toxicity profiles between techniques. What is the data supporting applicator-based brachytherapy? The initial randomized trial evaluating APBI primarily used interstitial brachytherapy, a technically challenging modality used in a limited number of centers. However, with the advent of the single-entry balloon applicator, brachytherapy-based APBI became available and its use increased.10,18 The MammoSite Registry included 1,449 cases treated with single-lumen applicators; with 5-year follow-up, the rate of ipsilateral breast tumor recurrence was 3.8% with 91% of patients having excellent/good cosmesis.19,20 These findings are consistent with smaller applicator-based brachytherapy series and confirm excellent clinical outcomes with the technique.21,22 Additionally, since the initial studies evaluating single-lumen applicators, multilumen and strut applicators have been developed, which have been shown to improve target coverage and reduce dose to organs at risk, potentially further improving outcomes.23,24 It should be noted that interstitial and applicator-based brachytherapy use slightly different expansions, with applicator brachytherapy traditionally using a 1-cm expansion around the cavity, compared to 2 cm with interstitial brachytherapy.11,12,25 More data is expected as applicator-based brachytherapy was included on NSABP B-39; in the interim, applicator-brachytherapy remains a standard APBI option for appropriate patients, with data supporting excellent clinical and toxicity outcomes. Are there toxicity-related concerns regarding brachytherapy-based APBI? What external-beam approaches should be used? Clinicians can consider several external-beam APBI approaches. The initial modern external technique was described by Baglan et al and delivered a dose of 38.5 Gy in 10 fractions twice daily using noncoplanar beams to a tumor volume that included a 1.5-cm clinical target volume expansion along with an additional 1 cm for internal target volume and planning target volume.33 This technique was found to have excellent clinical outcomes and toxicity profiles in the William Beaumont Hospital experience. 32 Unfortunately, concerns regarding the toxicity profile with this technique have emerged, including outcomes from the RAPID trial, RTOG 0319 as well as data from Tufts University and the University of Michigan.13,34-36 However, analysis of the 3D-CRT cohort from NSABP B39 and data from a Spanish randomized trial have failed to confirm these findings; as such, this remains an area of further study and is summarized in Tables 2a and b.14,15 In the interim, alternatives to this technique have emerged. The first is the use of intensity-modulated radiation therapy (IMRT). This technique was evaluated by Lei et al and found to have low rates of local recurrence, 88%-90% excellent/good cosmesis, and low rates of toxicity using the same 38.5 Gy/10 fraction regimen.37 An alternative IMRT approach used by Livi et al featured an every-other-day approach (30 Gy/5 fractions), with 1-cm CTV, and a 1-cm PTV expansion. Data from the randomized study demonstrated reduced toxicity with APBI IMRT compared to SWBI, and improved cosmesis.16 Alternatively, instead of switching external beam techniques, one can switch the dose and fractionation from 38.5 Gy/10 fractions delivered twice daily to daily regimens such as the Florence regimen or a more protracted course of 40 Gy/15 fractions, which was utilized in the IMPORT LOW trial.16,17 At this time, external APBI should still be considered for patients; while further data on the 3D-CRT technique will emerge from NSABP B-39/RTOG 0413, physicians should consider IMRT or daily fractionation to minimize toxicity risk and improve cosmetic outcomes. What is the data surrounding proton therapy to deliver APBI? How does intraoperative radiation therapy fit in the context of APBI? What are the cost concerns? With respect to other APBI techniques, while proton APBI remains investigational, recent cost studies have demonstrated comparable cost for protons compared to 3D-CRT SWBI and alternative APBI techniques (brachytherapy), while finding protons more expensive than 3D-CRT AWBI and 3D-CRT APBI.42 IORT has been heralded as a means to reduce the cost of adjuvant radiotherapy;54 however, when factoring in the costs of supplemental WBI, increased OR time, and management of recurrences, SWBI, AWBI, and APBI are considered cost-effective.55 Moving forward, to properly evaluate APBI cost-effectiveness, studies must move beyond absolute reimbursement and use techniques that incorporate patient costs associated with treatment duration, as well as the impact on quality of life and toxicity profiles. One of the greatest challenges facing clinicians is determining which patients are appropriate for APBI. One way of assessing eligibility is to use the inclusion criteria from published randomized trials to guide selection. However, concerns exist, as data that evaluates outcomes for subsets within these trials is limited. Additionally, several societies have released consensus guidelines for treatment off-protocol, including ASTRO, the American Brachytherapy Society, Groupe Europeen de Curiethrapie-European Society of Therapeutic Radiology and Oncology, and the American Society of Breast Surgeons. 29,30,56,57 As data continues to emerge, these guidelines will evolve; however, the current ASTRO groupings have failed to correlate with risk of local recurrence. As such, further study is required.58,59 At this time, ideal candidates for APBI include those 50 years or older with T1-2N0 tumors (≤ 3 cm)/DCIS (≤ 3 cm) and negative surgical margins without lymphovascular space invasion. Where does APBI stand as a treatment option? APBI is a standard-of-care treatment option for appropriately selected patients with early stage breast cancer. The basis of this recommendation is the publication of 5 randomized clinical trials demonstrating no difference in rates of local recurrence compared to SWBI or AWBI with mature follow-up. Similarly, randomized data has demonstrated acceptable toxicity profiles for interstitial and IMRT APBI, while prospective data has demonstrated the safety and efficacy of applicator APBI. While the data has limitations, it justifies routine use of APBI in appropriate patients, with future data expected to refine treatment techniques and selection criteria rather than focus on APBI validation. With the publication of 7 randomized trials and availability of long-term outcomes, APBI represents a standard-of-care treatment approach following breast-conserving surgery. Patients eligible for SWBI and AWBI should be considered for APBI in light of significant overlap in eligibility criteria. Studies are underway to further shorten the treatment duration of APBI, thereby reducing the burden of adjuvant treatment for women with early stage breast cancer. Fisher B, Anderson S, Bryant J, et al. Twenty-year follow-up of a randomized trial comparing total mastectomy, lumpectomy, and lumpectomy plus irradiation for the treatment of invasive breast cancer. N Engl J Med. 2002;347:1233-1241. Veronesi U, Cascinelli N, Mariani L, et al. Twenty-year follow-up of a randomized study comparing breast-conserving surgery with radical mastectomy for early breast cancer. N Engl J Med. 2002;347:1227-1232. Litiere S, Werutsky G, Fentiman IS, et al. Breast conserving therapy versus mastectomy for stage I-II breast cancer: 20 year follow-up of the EORTC 10801 phase 3 randomised trial. Lancet Oncol. 2012;13:412-419. Morrow M, White J, Moughan J, et al: Factors predicting the use of breast-conserving therapy in stage I and II breast carcinoma. J Clin Oncol. 2001;19:2254-2262. Polednak AP: Trends in, and predictors of, breast-conserving surgery and radiotherapy for breast cancer in Connecticut, 1988–1997. Int J Radiat Oncol Biol Phys. 2002;53:157-163. Whelan TJ, Pignol JP, Levine MN, et al. Long-term results of hypofractionated radiation therapy for breast cancer. N Engl J Med. 2010;362:513-520. Haviland JS, Owen JR, Dewar JA, et al. The UK standardization of breast radiotherapy (START) trials of radiotherapy hypofractionation for treatment of early breast cancer: 10-year follow-up results of two randomised controlled trials. Lancet Oncol. 2013;14:1086-1094. Shaitelman SF, Schlembach PJ, Arzu I, et al. Acute and short-term toxic effects of conventionally fractionated vs hypofractionated whole-breast irradiation: a randomized clinical trial. JAMA Oncol. 2015;1:931-941. National Comprehensive Cancer Network. Breast Cancer, Version 2.2016. http://www.nccn.org/professionals/physician_gls/pdf/breast.pdf. Accessed June 14, 2016. Husain ZA, Lloyd S, Shah C, et al. Changes in brachytherapy-based APBI patient selection immediately before and after publication of the ASTRO consensus statement. Brachytherapy. 2015;14:490-495. Polgar C, Fodor J, Major T, et al. Breast-conserving therapy with partial or whole breast irradiation: ten-year results of the Budapest randomized trial. Radiother Oncol. 2013;108:197-202. Strnad V, Ott OJ, Hildebrandt G, et al. 5-year results of accelerated partial breast irradiation using sole interstitial multicatheter brachytherapy versus whole-breast irradiation with boost after breast-conserving surgery for low-risk invasive and in-situ carcinoma of the female breast: a randomised phase 3, non-inferiority trial. Lancet. 2016;387:229-238. Olivotto IA, Whelan TJ, Parpia S, et al. Interim cosmetic and toxicity results from RAPID: a randomized trial of accelerated partial breast irradiation using three-dimensional conformal external beam radiation therapy. J Clin Oncol. 2013;31:4038-4045. Julian TB, Constantino JP, Vicini FA, et al. Early toxicity results with 3D conformal external beam (CEBT) from the NSABP B-39/RTOG 0413 accelerated partial breast irradiation (APBI) trial. Presented at the 2011 American Society of Clinical Oncology Annual Meeting, June 4-8 2011, Chicago, IL. Rodriguez N, Sanz X, Dengra J, et al. Five-year outcomes, cosmesis, and toxicity with 3-dimensional conformal external beam radiation therapy to deliver accelerated partial breast irradiation. Int J Radiat Oncol Biol Phys. 2013;87:1051-1057. Livi L, Meattini I, Marrazzo L, et al. Accelerated partial breast irradiation using intensity-modulated radiotherapy versus whole breast irradiation: 5-year survival analysis of a phase 3 randomised controlled trial. Eur J Cancer. 2015;51:451-463. Coles C, Agarwal R, Ah-See ML, et al. Partial breast radiotherapy for women with early breast cancer: first results of local recurrence data for IMPORT LOW (CRUK/06/003). Eur J Cancer. 2016;57:S4. Benitez PR, Keisch ME, Vicini F, et al. Five-year results: the initial clinical trial of MammoSite balloon brachytherapy for partial breast irradiation in early-stage breast cancer. Am J Surg. 2007;194:456-462. Shah C, Badiyan S, Ben Wilkinson J, et al. Treatment efficacy with accelerated partial breast irradiation (APBI): final analysis of the American Society of Breast Surgeons MammoSite breast brachytherapy trial. Ann Surg Oncol. 2013;20:3279-3285. Shah C, Khwaja S, Badiyan S, et al. Brachytherapy-based partial breast irradiation is associated with low rates of complications and excellent cosmesis. Brachytherapy. 2013;12:278-284. Cuttino LW, Keisch M, Jenrette JM, et al. Multi-institutional experience using the MammoSite radiation therapy system in the treatment of early-stage breast cancer: 2-year results. Int J Radiat Oncol Biol Phys. 2008;71:107-114. Harper JL, Watkins JM, Zauls AJ, et al. Six-year experience: long-term disease control outcomes for partial breast irradiation using MammoSite balloon brachytherapy. Am J Surg. 2010;199:204-209. Gurdalli S, Kuske RR, Quiet CA, et al. Dosimetric performance of Strut-Adjusted Volume Implant: a new single-entry multicatheter breast brachytherapy applicator. Brachytherapy. 2011;10:128-135. Shah C, Ghilezan M, Arthur D, et al. Initial clinical experience with multilumen brachytherapy catheters for accelerated partial breast irradiation. Brachytherapy. 2012;11:369-373. Shah C, Wobb J, Manyam B, et al. Accelerated partial breast irradiation utilizing brachytherapy: patient selection and workflow. J Contemp Brachytherapy. 2016;8:90-94. Smith GL, Xu Y, Buchholz TA, et al. Association between treatment with brachytherapy vs whole-breast irradiation and subsequent mastectomy, complications, and survival among older women with invasive breast cancer. JAMA. 2012;307:1827-1837. Presley CJ, Soulos PR, Herrin J, et al. Patterns of use and short-term complications of breast brachytherapy in the national Medicare population from 2008-2009. J Clin Oncol. 2012;30:4302-4307. Chen PY. Accelerated partial breast irradiation: keeping guidelines in step with evolving data. Int J Radiat Oncol Biol Phys 2014;88:263-265. Khan AJ, Vicini FA, Arthur D. Brachytherapy vs. whole-breast irradiation for breast cancer. JAMA 2012;308:567. Smith BD, Arthur DW, Buchholz TA, et al. Accelerated partial breast irradiation consensus statement from the American Society for Radiation Oncology (ASTRO). Int J Radiat Oncol Biol Phys. 2009;74:987-1001. Shah C, Vicini F, Wazer DE, et al. 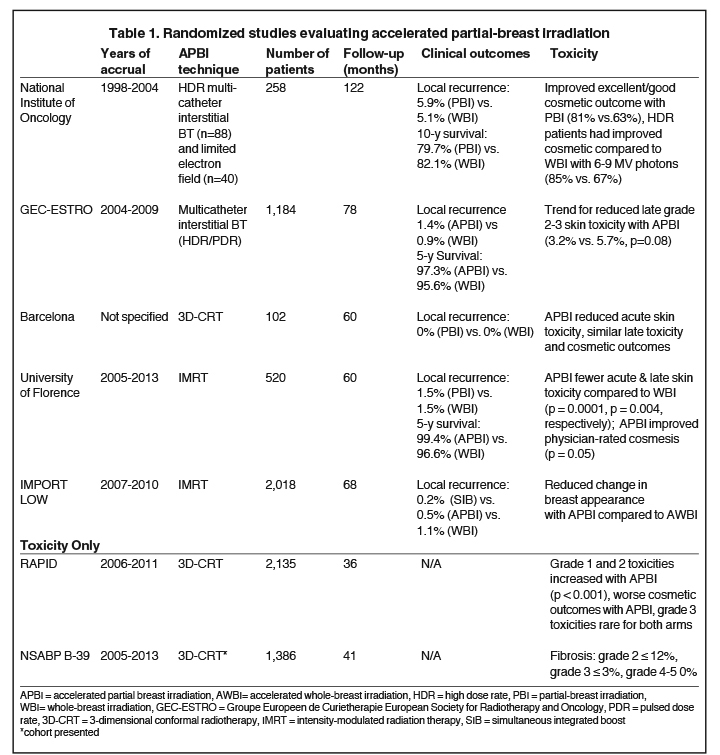 The American Brachytherapy Society consensus statement for accelerated partial breast irradiation. Brachytherapy. 2013;12:267-277. Baglan KL, Sharpe MB, Jaffray D, et al. Accelerated partial breast irradiation using 3D conformal radiation therapy (3D-CRT). Int J Radiat Oncol Biol Phys. 2003;55:302-311. Shah C, Wilkinson JB, Lanni T, et al. Five-year outcomes and toxicities using 3-dimensional conformal external beam radiation therapy to deliver accelerated partial breast irradiation. Clin Breast Cancer. 2013;13:206-211. Chafe S, Moughan J, McCormick B, et al. Late toxicity and patient self-assessment of breast appearance/satisfaction on RTOG 0319: a phase 2 trial of 3-dimensional conformal radiation therapy-accelerated partial breast irradiation following lumpectomy for stages I and II breast cancer. Int J Radiat Oncol Biol Phys. 2013;86:854-859. Leonard KL, Hepel JT, Hiatt JR, et al. The effect of dose-volume parameters and interfraction interval on cosmetic outcome and toxicity after 3-dimensional conformal accelerated partial breast irradiation. Int J Radiat Oncol Biol Phys. 2013;85:623-629. Liss AL, Ben-David MA, Jagsi R, et al. Decline of cosmetic outcomes follow accelerated partial breast irradiation using intensity modulated radiation therapy: results of a single-institution prospective clinical trial. Int J Radiat Oncol Biol Phys. 2014;89:96-102. Lei RY, Leonard CE, Howell KT, et al. Four-year clinical update from a prospective trial of accelerated partial breast intensity-modulated radiotherapy (APBIMRT). Breast Cancer Res Treat. 2013;140:119-133. Kozak RR, Smith BL, Adams J, et al. Accelerated partial- breast irradiation using proton beams: initial clinical experience. Int J Radiat Oncol Biol Phys. 2006;66:691-698. Galland-Girodet S, Pashtan I, MacDonald SM, et al. Long-term cosmetic outcomes and toxicities of proton therapy compared with photon-based-3-dimensional conformal accelerated partial-breast irradiation: a phase 1 trial. Int J Radiat Oncol Biol Phys. 2014;90:493-500. Chang JH, Lee NK, Kim JY, et al. Phase II trial of proton beam accelerated partial breast irradiation in breast cancer. Radiother Oncol. 2013;108:209-214. Bush DA, Do S, Lum S, et al. Partial breast radiation therapy with proton beam: 5-year results with cosmetic outcomes. Int J Radiat Oncol Biol Phys. 2014;90:501-505. Ovalle V, Strom EA, Godby J, et al. Proton partial-breast irradiation for early-stage cancer: is it really so costly? Int J Radiat Oncol Biol Phys. 2016;95:49-51. American Society for Radiation Oncology. Clinical Practice Statements: Public Comment--Accelerated Partial Breast Irradiation Consensus Statement. Available at: https://www.astro.org/Clinical-Practice-Statements.aspx. Accessed June 14, 2016. Khan AJ, Arthur DW, Vicini FA. On the road to intraoperative radiotherapy: more proceed with caution signs. Oncology. 2013;27:113-114. Shah C, Wobb J, Khan A. Intraoperative radiation therapy in breast cancer: still not ready for prime time. Ann Surg Oncol. 2016;23:1796-1798. Veronesi U, Orecchia R, Masonneuve P, et al. Intraoperative radiotherapy versus external beam radiotherapy for early breast cancer (ELIOT): a randomised controlled equivalence trial. Lancet Oncol. 2013;14:1269-1277. Vaidya JS, Baum M, Tobias JS, et al. Targeted intraoperative radiotherapy (TARGIT): an innovative approach to partial-breast irradiation. Semin Radiat Oncol. 2005;15:84-91. Cuzick J. Radiotherapy for breast cancer, the TARGIT-A trial. Lancet. 2014;383:1716. Vaidya JS, Bulsara M, Wenz F, et al. Pride, prejudice, or science: attitudes towards the results of the TARGIT-A trial of targeted intraoperative radiation therapy in breast cancer. Int J Radiat Oncol Biol Phys. 2015;92:491-497. Hepel J, Wazer DE. A flawed study should not define a new standard of care. Int J Radiat Oncol Biol Phys. 2015;91:255-257. Lanni T, Keisch M, Shah C, et al. A cost comparison analysis of adjuvant radiation therapy techniques after breast-conserving surgery. Breast J. 2013;19:162-167. Shah C, Lanni TB, Saini H, et al. Cost-efficacy of acceleration partial breast irradiation compared with whole-breast irradiation. Breast Cancer Res Treat. 2013;138:127-135. Schutzer ME, Arthur DW, Anscher MS. Time-driven activity based costing: a comparative cost analysis of whole-breast radiotherapy versus balloon-based brachytherapy in the management of early-stage breast cancer. J Oncol Prac 2016;12:e584-593. Grobmyer SR, Kughtsey JL, Bryant CM, et al. Low-kilovoltage, single-dose intraoperative radiation therapy for breast cancer: results and impact on a multidisciplinary breast program. J Am Coll Sur 2013;216:617-623. Shah C, Badiyan S, Khwaja S, et al. Evaluating radiotherapy options in breast cancer: does intraoperative radiotherapy represent the most cost-efficacious option? Clin Breast Cancer. 2014;14:141-146. Polgar C, Van Limbergen E, Potter R, et al. Patient selection for accelerated partial-breast irradiation (APBI) after breast conserving surgery: recommendations of the Groupe European de Curietherapie-European Society for Therapuetic Radiology and Oncology (GEC-ESTRO) breast cancer working group based on clinical evidence (2009). Radiother Oncol. 2010;94:264-273. The American Society of Breast Surgeons. Consensus Statement for Accelerated Partial Breast Irradiation. American Society of Breast Surgeons Web site. https://www.breastsurgeons.org/statements/PDF_Statements/APBI.pdf. Updated August 15, 2012. Accessed June 14, 2016. Shaitelman SF, Vicini FA, Beitsch P, et al. Five-year outcome of patients classified using American Society for Radiation Oncology consensus statement guidelines for the application of accelerated partial breast irradiation: an analysis of patients treated on the American Society of Breast Surgeons MammoSite Registry Trial. Cancer. 2010;116:4677-4685. Vicini FA, Arthur D, Wazer D, et al. Limitations of the American Society of Therapeutic Radiology and Oncology Consensus guidelines on the use of accelerated partial breast irradiation. Int J Radiat Oncol Biol Phys. 2011;79:977-984. Wilkinson JB, Martinez AA, Chen PY, et al. Four-year results using balloon-based brachytherapy to deliver accelerated partial breast irradiation with a 2-day dose fractionation schedule. Brachytherapy. 2012;11:97-104. Accelerated Partial Breast Radiation Therapy Using High-Dose Rate Brachytherapy in Treating Patients with Early Stage Breast Cancer After Surgery (TRIUMPH-T). Available at: https://clinicaltrials.gov/ct2/show/NCT02526498?term=NCT02526498&rank=1. Trifiletti DM, Showalter TN, Libby B, et al. Intraoperative breast radiation therapy with image guidance: Findings from CT images obtained in prospective trial of intraoperative high-dose-rate brachytherapy with CT on rails. Brachytherapy. 2015;14:919-924. Smile TD, Karthik N, Reilly K, Westerbeck E, Takiar R, Vajapey R, Tendulkar R, Shah C. Accelerated partial-breast irradiation: An emerging standard of care. Appl Rad Oncol. 2016;5(3):12-18. Mr. Smile, Mr. Karthik, Mr. Reilly, Mr. Westerbeck, Ms. Takiar, and Ms. Vajapey are medical studients; Dr. Tendulkar is an associate professor; and Dr. Shah is associate staff and director of clinical research, Cleveland Clinic, Taussig Cancer Institute, Department of Radiation Oncology, Cleveland, OH.